At the Fence: WorkIt Wednesday : LaceLockers Review + Giveaway! How is everyone doing this morning? I am doing GREAT! We are pretty busy between packing and preparing for our upcoming trip to Pigeon Forge, getting kitty settled in, etc. Okay, has anyone ever heard of LaceLockers by Stash Sports? And yes, they are as easy to use as 1. 2. 3.! The LaceLockers were made to help keep your shoelaces tied. How many times have you been running or participating in another sport, and you have to stop and re-tie your laces. Not with the LaceLockers! 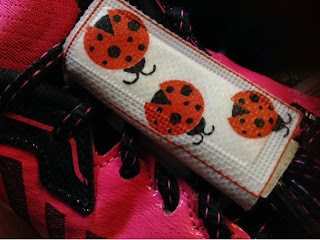 I received a set of White Ladybug Graphic LaceLockers, and they are GREAT for running. No more loose laces or having to double-knot! My two sisters, who are also training with me, have decided that they need a pair! So, the LaceLockers are PERFECT for anybody that has trouble with laces coming un-done. You can purchase these in a variety of styles on the LaceLockers website. You can also Like them on Facebook and Follow them on Twitter to stay up to date on their latest news. Two Winners Will Each Receive 1 Pair of LaceLockers! LaceLockers has also given me a 15% off code for my Neighbors to use.